Long Island Class III Championship between Wantagh and East Islip set to start at 4:30. As always, updates to follow. Wantagh has won the toss and will defer. East Islip will be the first offense on the field. East Islip calls its second timeout of the opening 6 minutes with the ball on Wantagh's 1-yd line. 3rd-and-goal coming up. Kyle Fleitman keeps it himself on 4th-and-1 from the half-yard line. 11-play, 62-yard drive. East Islip leads 7-0 after the PAT. Those are the first points Wantagh has allowed these playoffs. 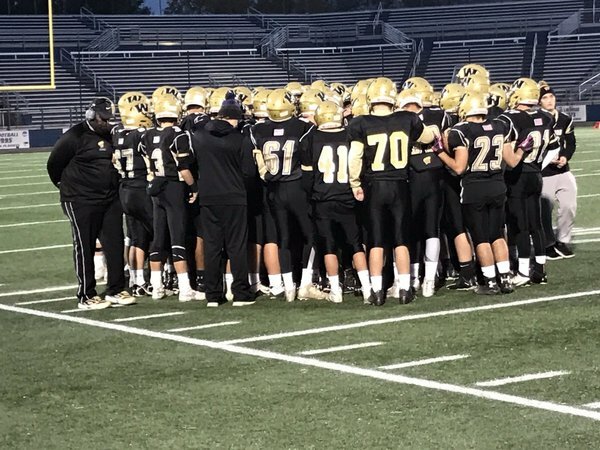 Wantagh defense is nasty and have shut out three straight playoff opponents. East Islip's first drive is a TD, Redmen lead, 7-0. Tommy Rohan takes a dump screen from Jake Castellano, runs 30 yards to the house. 7-7 after the PAT. END OF 1Q: Wantagh 7, East Islip 7. Warriors defense allows first points of the postseason, but a screen-pass TD knots the score. Tommy Rohan scores again on a run from 3 yards out. 8-play, 46-yard drive after Jimmy Joyce's pick. PAT good. 14-7, Wantagh. Justin Taveras with a 13-yard TD runs as East Islip ties the score at 14. Second quarter. Patrick Walsh's 85-yard kick return TD for Wantagh called back because of an illegal block in the back. Ball now on EI's 47-yd line. EI calls its final timeout of the half. Wantagh is driving, so it will be 1st-and-10 from EI's 13 with 3:03 left in the half. 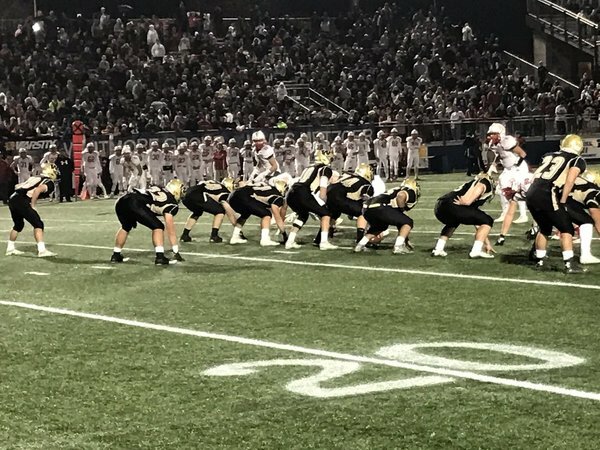 FB Gavin Casey punches the ball in from the 1-yard line, giving Wantagh a 21-14 lead after the PAT by Michael Piergiovanni. Now with 2:26 to play in the second, East Islip needs to drive the field and score. Remember, Wantagh gets the ball after the half. END OF HALF: 21-14, Wantagh, which will also receive after the break. Gavin Casey and Tommy Rohan have provided running balance. Wantagh is set to return the opening kickoff of the second half. Given how the first half played, this should be exciting. Wantagh will start from its own 40-yard line after a short squib kick. East Islip driving in the third, facing a 3rd-and-1 from Wantagh's 46. East Islip drive stalls as Wantagh's Sean Colbert intercepts pass at Warriors' 2 & returns to 15. Wantagh leads 21-14 after three quarters. East Islip punts and pins Wantagh inside the 10-yard line. Warriors start from the 4 after a penalty with 8:44 to play. 21-14, Wantagh. Wantagh punts out of its own endzone after great defense from EI. East Islip starts from Wantagh's 30 yard line down 7 in the 4th. Potential game-changing play coming. East Islip has the ball on Wantagh's 15-yd line down 21-14, 4th-and-8. 3:47 to play. Timeout EI. East Islip throws and it's incomplete. Only one timeout remaining. This Wantagh D continues to impress. Two big second-half stops. The discipline on the perimeter is the key - they haven't allowed a big run. Wantagh defense hangs tough on 4th down, clinching the Long Island Class III Championship, 21-14. 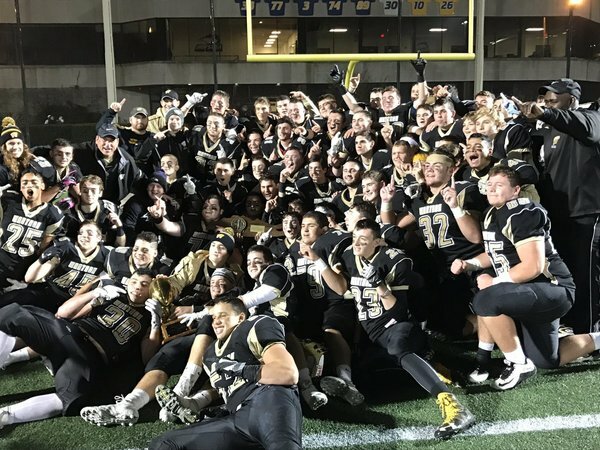 The Wantagh Warriors defeated East Islip, 21-14, to win the Class III Long Island championship. Celebration video. Congratulations to head coach Keith Sachs and the Wantagh Warriors on winning the LI Class II title. 1st time to 12-0. What an achievement! Gavin Casey, Joe Valenti, Jimmy Joyce, Sean Colbert and Anthony D'Onofrio played outstanding "D" and were the difference in Class III win. A real pleasure working w/ @kennydejohn , @owenobri , @AndySlawson , @zogsport7 & @Gregg_Sarra today at LICs. Looking forward to Sunday.